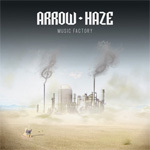 Arrow Haze is an upstart melodic rock band from Belgium debuting with Music Factory. First impressions give rise to some interesting observations and suspicions. The first observation is that this a guitar driven album. The first suspicion is how they do they count Deep Purple as one of their influences. Arrow Haze: Crisis (Official Video). While not necessarily reflecting early proto-metal, one could suggest that Arrow Haze is after a classic rock sound. They also mention The Doors and Pink Floyd as influences. You'll hear more the latter and less of the former here. Maybe Floyd meets modern day Muse. But that may only make things more hazy. For instance, one of the best tracks, Along the Way, is clearly melodic hard rock wrapped in dense atmosphere. And atmosphere plays a big part throughout Music Factory; there's an ethereal feeling to nearly all the songs; Visions is a good example. The vocal arrangements add to the airy feel with their uncomplicated wistful character. You might also want to pin a progressive rock tag to Arrow Haze, though not on the overly technical side. You catch some of this on a tune like Stronger Tides. Mostly, Music Factory offers some terrific melodic, sometimes heavier, rock with lots of great guitar work from riffage to solos wrapped in some very pleasing vocal arrangements. Nice stuff, and easily recommended. Arrow Haze's Music Factory offers some terrific melodic, sometimes heavier, rock with lots of great guitar work from riffage to solos, wrapped in some very pleasing vocal arrangements.